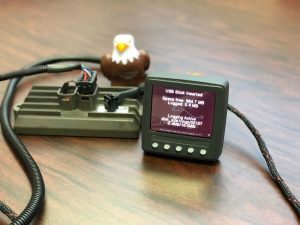 New Eagle has an in-vehicle data logging solution to make CAN data logging easy. The VeeCAN 320 (VC320) data logger matched with Raptor-CAN allows a user to collect and view raw CAN or Analog data. The VC320 reads and – most importantly – displays data traffic, thereby allowing you to verify whether the device is wired correctly, or whether the sending unit is operating. Data stored on an easy to move USB memory stick that is transferred to your PC for viewing via Raptor-CAN or conversion to your favorite tool. The rugged VC320 is now available with 2 CAN bus channels and optional analog inputs. Download our Data Logging white paper here or contact us with your requirements. Stay up-to-date on product additions, software updates, application highlights, upcoming events and more by subscribing to our eNews. Delivered once per quarter to your inbox, you’ll get the briefing you need to stay in-the-loop on everything New Eagle. Are you a Raptor user? Be among the first to learn about software updates, training options, and product additions. Just subscribe to our monthly Raptor newsletter to get these notifications delivered right to your inbox. Plus, get exclusive tips to help you maximize Raptor’s power.